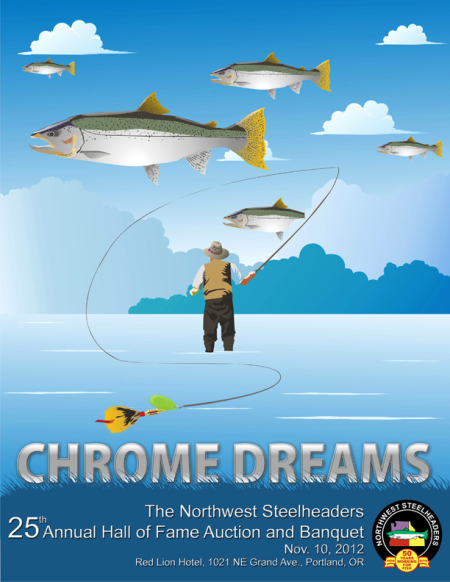 Chome Dreams, the Association of Northwest Steelheaders’ 25th Annual Hall of Fame Auction and Banquet will be held on Nov. 10, 2012. Door's open at 4 pm. This year’s HOF promises to be the biggest and best ever, with an exciting new venue overlooking the city, incredible array of fantastic experiences and items to bid on, fun games to participate in, and scrumptious food and drinks. Chrome Dreams will be held at Red Lion Hotel, across from the Oregon Convention Center, 1021 NE Grand Ave., in Portland, OR. Alaska Dream Trip to Tomans King Camp. This amazing adventure includes a 5 day, 4 night stay for two people at the camp located on the bank of the Nushagak River with an excellent run only feet away from shore. Nushagak chinook arrive in prime condition, the color of freshly-minted silver. Full of vigor, the average fish runs 25 pounds with exceptional fish going to 50. It is these chinooks' combination of tenacity and numbers that creates the finest salmon fishing in the world. Includes guided fishing, lodging, meals, licenses, permits, fish processing, and travel from Dillingham, AK. Mercury 9.9 kicker motor or value of toward any Stevens Marine motor. Duck and/or pheasant hunting trip for two people in Tygh Valley in Eastern Oregon that includes lodging and meals. 48 holes of golf at local courses. Great guided fishing trips with pro-guides like Jack Glass, Brad Staples, Bill Miller, Trevor Storlie, Marty Sheppard, Ed Fast, Bob Rees, Ed Chin, Steve Johnson and many more on rivers that include the Columbia, Willamette, Klickitat, Deschutes, McKenzie, Clackamas, Sandy, Santiam, John Day and Cowlitz. Whether you want to target salmon, steelhead, sturgeon, trout, kokanee, walleye or bass with gear or a fly, we’ve got a trip for you. Week-long romantic getaway or family vacation at a rental home on the Molalla River that includes private access to some of the upper river’s best fishing holes, three bedrooms, hot tub, two fire places, TVs in every room, arcade-style games and much more. Catch two Blazer games on the club level. These tickets include all-you-can eat buffet, in-seat drink service and free parking in the Legacy lot. Ruger American 308 rifle or value towards another gun at Wholesale Sports. Rod blanks from North Fork Composites. Fishing gear including rods, reels, tackle, fish boxes, drift boat stands, fish boxes, fillet knives, anchors, fish smokers to cook your fish, and much more. Nights out on the town that includes your meals and entertainment, and fantastic overnight stays. Much, much more. Chome Dreams is the most and best items and experiences we have ever assembled for a Hall of Fame. To see the list of items and experiences available in the Live, "Tripapooloza" Super Silent, and Silent auctions, please click HERE. This year’s emcee is Cody Herman of the popular TV show Outdoor GPS. Cody promises to keep things fun, lively and moving quickly. If you would like donate goods or services, please call 503-653-4176 or e-mail office@anws.org. We look forward making your dreams come true the evening of Nov. 10. As always, all auction profits benefit fish runs and fishing opportunity in the Pacific Northwest. Dream big!